I was in "the city" last week, Somervile, MA to be more precise, & I got to see some urban bike commuters. Since it was still chilly there were several drop bar mitts around. What caught my eye tho, was a guy who had his installed in a novel way. He sped by so I couldn't closely examine his install. Others flew by but they all looked set up like mine normally look. 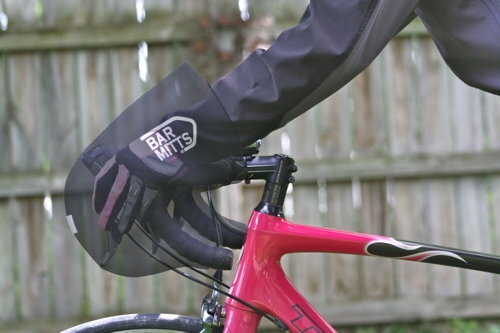 The mitts were installed in such a way as to fully expose the lower portion of the drop bar. He was still protected on the hoods. Maybe he just scrunched them up more? is anyone using there's in that manner? if so, wutz the trick? Last edited by rumrunn6; 04-10-19 at 06:50 AM. Not me. I used mine approx 12-15 times in total this past winter. I just stayed on the hoods. I can see and access a large portion of the drops on my bars with bar mitts on, but there's no trick involved, they're just older handlebars with a longer and deeper shape than the modern compact bars in your picture. As Ghazmh says, if it's cold enough to need the bar mitts I almost never use the exposed parts of the bar anyways... the pogies also block access to the brake levers from the drops so there's that issue too. Reach me faster by email.